Exposure to excessive noise levels can significantly increase your risk of hearing loss or exacerbate an existing hearing impairment. Concerts, sporting events, hunting, noisy work environments or simply listening to music too loudly can all irreparably damage hearing. Repeated noise exposure early in life can be compounded as you get older. 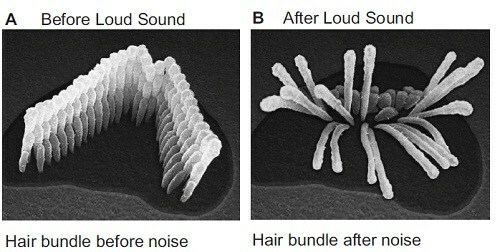 Once the fragile inner hair cells within the cochlea are damaged as shown in the following pic, it is irreparable and leads to permanent hearing loss. Hearing protection prevents damaging noise levels by dampening the loud sounds but still allowing you to hear the sounds you want to hear clearly. 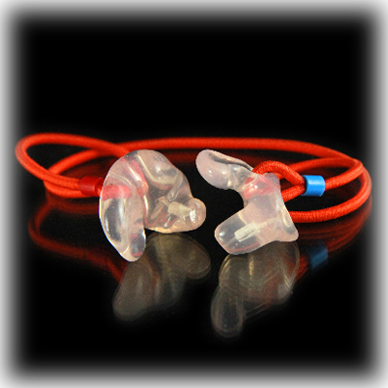 Our hearing protection goes beyond the kind of earplugs you buy at over the counter stores — we offer a variety of custom-fit hearing protection designed to fit the contours of your ear perfectly, offering a snug, comfortable fit and all-day protection from dangerous noise. My Ear Melodi plugs have been specially designed for the Professional Audio and the Audiophile market and it provides a maximum acoustic performance in a miniature profile. With a relatively flat frequency response attenuation, music lovers will be able to enjoy sounds at intended frequencies with no compromise to quality and integrity, while protecting their ears. My Ear Worke Plugs use cutting edge technology to provide attenuation at selected frequencies with surgical precision. This allows discriminatory sound attenuation without compromising speech clarity. My Ear Warrior Plugs are developed for firearm use, because they provide maximum protection against high frequency and impulse sounds of gunfire and blasts. The warrior plugs allow the user to maintain normal communication in a military environment. Recreational use (As swim plugs)- Seasoned swimmers understand the importance of wearing ear protection to help prevent swimmer’s ear, surfer’s ear, and eardrum ruptures. Ear protection for swimmers help the ears equalize underwater, and are custom fit to create tight seals that keep the ear canal dry. Health (As sleep plugs)- Those who are kept awake by nighttime noises should also consider ear plugs, as the effects of poor sleep is lasting and damaging to health. Whether it’s the result of street noise, loud neighbors, or a snoring partner, our custom-fit ear protection is so comfortable, you’ll barely know it’s there — because you’ll be sleeping too soundly to notice. Industrial use -This is helpful for those exposed to loud sounds on a regular basis and help attenuate sounds to a safe level for your ears. Musicians- A great option for band members who don’t use monitors (including marching bands) and concert. They provide a flat attenuation, which allows music to be heard accurately, but at a safer volume. Filters are available in 9, 15, or 25dB of attenuation. Filters can also be interchanged with solid plugs, which are included with every order, thereby converting them into a traditional earplug. If you are a musician or an audiophile, Enjoy the utmost sonic accuracy and advanced hearing protection, in total style and comfort. We’re approaching in-ear monitors in a whole new way, using science that leverages our innovations in the medical, music, acoustic and aerospace fields to craft in-ear monitors that are as unique as you are—from custom precision-tuned systems to personalized finishes that letyour monitors become an extension of your varied lifestyle. We offer a full range of universal and custom-molded options, with versatile accessories for a one-of-a-kind experience. Our systems will take you from the studio to the stage to the street, without missing a beat.